Google recently released Android 7.1 Developer Preview with some new features including Night Light and Fingerprint Reader Gestures as 'Move'. However, Nexus devices won't be treated to the Pixel and Pixel XL's Night Light and Fingerprint sensor gestures functionality as Google's team member +Ian Lake confirmed this to be the case in a Google+ post. Unfortunately, the Nexus 6P, the Nexus 5X, or any other Nexus device won't be getting these bits of functionality, which are available in Android 7.1. Night Light reduces the amount of blue light emitted by the display, making it less harsh on your eyes at night or in dim surroundings. As for the fingerprint sensor, there are shortcuts such as swiping down on the Pixel and Pixel XL's fingerprint sensor to pull down the notification shade. More might be coming down the road with software updates. The feature requires specific hardware built in the fingerprint sensor, though, and the Nexus 6P and 5X lack these bits of gear. Night Light too relies on a hardware implementation – a composer interface that does color transformations on the display driver, instead of in software. 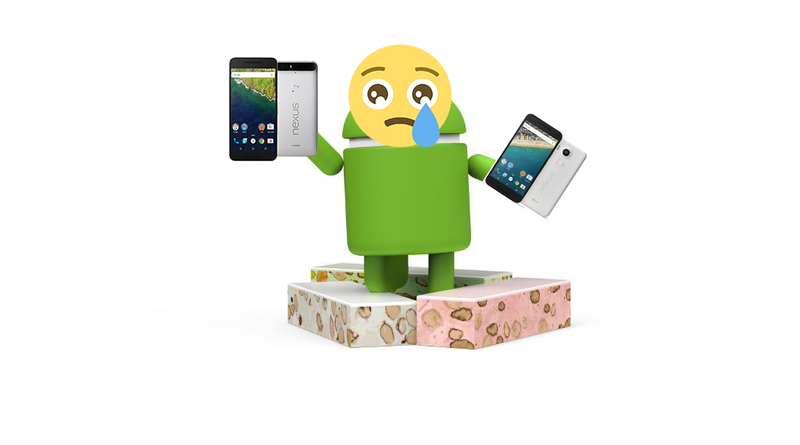 As a little solace, both Nexus devices will be getting Android 7.1 updates in time, which is still a privilege of very few smartphones on the market.